In this festive holiday video, we see all the “Historic Sites in Virginia” gingerbread houses entered in this year’s contest. To see the list of winners, click here. The exhibit runs until December 30. Click here to learn more about visiting George Washington’s boyhood home this holiday season. Yes, Virginia, there is a Christmas Hedgehog! During the holidays, it’s the curatorial team’s job to festoon Historic Kenmore in period-appropriate holiday swag to celebrate the Christmas season. Greenery is brought in to cheer up the rooms and a table of special desserts is laid out as if ready for Christmas guests. These sweet treats are a pretty traditional fare but one particular dessert garners far more attention and questions than the others: the hedgehog sitting at the center of the table. The Christmas dessert table complete with faux marzipan hedgehog in the Passage at Historic Kenmore. “What is it?” and “Why a hedgehog?” are heard from visitors again and again. I decided to investigate to see if I could find out how and why this spiny confection graced Betty Lewis’s table during the holidays. Unfortunately, my research raised more questions than answers and ultimately lead me to an interesting but ambiguous conclusion based mainly on my own conjecture. First, I have often heard the hedgehog referred to as a “cake” but it is not a cake. It is made out of marzipan; a sweet created using sugar or honey and ground almonds. Marzipan can be flavored, contain fruit and nuts, or even covered in chocolate …the possibilities are endless! It is often shaped into miniature fruits, vegetables, or animals and colored with dyes. The confection is usually eaten on special days or for special events. A closer view of the faux marzipan hedgehog. No one knows for sure where marzipan was first created but it likely originated in the Middle East around the ninth-century. It made its way to Europe through trade and immigration. Each country personalized the candy by adding its own unique ingredients and traditions. In Mrs. Smith’s The Compleat Housewife, the chapter “All Sorts of Cakes” includes a recipe for ‘march-pane’ which is an old English word for marzipan. The recipe is a traditional non-baked marzipan that includes ground almond, refined sugar and orange-flower water for flavoring. Twenty years after Mrs. Smith published her book, Mrs. Glasse published The Art of Cookery and, by this time, the hedgehog had made its debut. The Art of Cookery does not list marzipan specifically but in chapter sixteen titled “Cheesecakes, creams, jellies, whipt syllabubs” there is a recipe “To make a hedge-hog”. This is a cooked marzipan recipe that instructs the baker to form the almond paste into the shape of a hedge-hog with little slivered almond spines. How did the hedgehog become associated with this almond dessert? The short answer is I’m not sure. I researched hedgehogs trying to discover any relation to the holiday season, to winter, or to the New Year. I was unable to find any. Hedgehogs are native to England, where both cookbooks were published, but not to the Americas. Colonial Americans would likely never have seen a hedgehog. There is not a lot of positive symbolism or folklore associated with the little creatures besides being industrious and cute. They have been used medicinally for a variety of ailments and were a food source in many cultures. None of this provides a reason why these little creatures were immortalized in almond meal and sugar at Christmas. I think the most likely development of this holiday treat was a combination of coincidence and novelty. Someone made the marzipan for the holidays,shaped it into a dome, and then decorated it with almonds. Eventually maybe someone else thought this resembled a hedgehog and added a little hedgehog face because it was clever and cute. Why would Betty choose a marzipan hedgehog to sit on her holiday dessert table in colonial Virginia? As previously noted, marzipan was an established treat used to celebrate special days. The cost of the ingredients, which included two pounds of almonds, orange-flower water, canary wine, cream, butter and sugar, was substantial and illustrated to guests the effort and expense the family lavished on the party. While the table would probably have smaller bite-sized marzipan pieces in the more traditional fruit shapes, the novel hedgehog with the slivered almond spines created a visually appealing and attention-grabbing dish. The Christmas hedgehog was a great conversation starter then! The Christmas hedgehog is a great conversation starter now! Habeeb Salloum, Muna Salloum, and Leila Salloum, Sweet Delights from A Thousand and One Nights: The Story of Traditional Arab Sweets, (London: I.B. Tauris & Co. Ltd, 2013), 168: Sidney W. Mintz, “Color, Taste and Purity: Some Speculations on the Meanings of Marzipan”, Etnofoor, Jaarg. 4, Nr.1 (1991): 103-108. Thomas Dawson, The Good Huswifes Jewell (London: John Wolfe, 1587), 23; Thomas Dawson, The good Huswifes Handmaide for the Kitchin. (London: Richard Jones, 1594), 37b. Eliza Smith, The Compleat Housewife or, Accomplished Gentlewoman’s Companion, (Williamsburg: William Parks, 1742), 73. Hannah Glasse, The Art of Cookery, Made Plain and Easy (London: A. Millar and R. Tonson, 1765), 288. Mazin B. Qumsiyeh, Mammals of the Holy Land (Texas: Texas Tech University Press, 1996), 63. Jacqueline Simpson and Stephen Roud, A Dictionary of English Folklore (Oxford: Oxford University Press, 2000); Tatjana Civjan and Dainius Razauskas, “Hedgehog in Cosmogonic and Etiological Legends of the Balto-Balcanic Area,” Tautosakos darbai, no. XXI (2004): 79-91. Mazin B. Qumsiyeh, Mammals of the Holy Land (Texas: Texas Tech University Press, 1996), 64; Vincent Nijman and Daniel Bergin, “Trade in Hedgehogs in Morocco,” Journal of Threatened Taxa, (2015): 7132-7136. It’s the 30th year of a a long-standing holiday tradition: the Gingerbread Contest & Exhibit at George Washington’s Ferry Farm! This year’s theme is “Home for the Holidays.” Read about Thirty Years of Gingerbread. Adults and children alike will enjoy the sights and smells of the festive creations displayed at Ferry Farm! Ferry Farm’s hours are Monday – Saturday 10:00 a.m. – 4:00 p.m. and Sunday from 12:00 p.m. – 4:00 p.m. Ferry Farm is closed Christmas Eve and Christmas Day. The gingerbread exhibit ends on December 30. General admission to Ferry Farm and the exhibit is $8 adults, $4 students, under 6 free while admission to the exhibit only is $4 adults, $2 students, under 6 free. Ahhh Chocolate! Now is the time of year when we consume even more than usual, often from heart-shaped boxes gifted by an admirer. Probably one of the most universally loved foods, the average American consumes roughly 11 pounds of the stuff a year! It is hard to imagine a world without chocolate and this love of the heavenly substance stretches all the way back to our country’s colonial roots. However, banish the visual of George Washington chomping a chocolate bar while chopping down the cherry tree, chocolate bars are a fairly recent invention of the mid-19th century. Before the mid-1800s, if you had a craving for the world’s favorite sweet, you drank it! Drinking chocolate of the 18th century was different from our ubiquitous modern day cup of cocoa. It was made with either cacao nibs or blocks of compressed chocolate that were then grated or ground to a paste and dissolved in a warm liquid inside a dedicated ‘chocolate pot’. The chocolate was added to any combination of water, milk, cream, wine, or even brandy for an extra kick. This mixture was combined with sugar, though less than we use because it was an expensive import in colonial America. Other common ingredients included chili pepper, vanilla, nutmeg, or allspice. This resulted in a rich, sweet, spicy, and bitter drink that the colonists couldn’t get enough of. Popular ingredients in colonial-era chocolate drinks included (clockwise from top) sugar; cocoa beans, chocolate nibs, or chocolate block crushed and melted to form the foundation of the chocolate drink; vanilla; almonds; cinnamon; nutmeg; and chilis. We know that many early Americans were fans of chocolate, but it wasn’t available to everyone. In the 1700s, chocolate was still a fairly expensive drink, similar to tea or coffee, making it a beverage of the upper and middle classes. It was seen as a nutritious and filling health food, commonly had with breakfast. Chocolate was a well-known staple at the Washington breakfast table, often served alongside tea and hoecakes in honey and butter. In fact, the Washingtons were such fans of chocolate that in 1757 George Washington ordered 20 pounds of chocolate from British merchant Thomas Knox. While living at Kenmore Plantation, George’s sister Betty Washington Lewis ordered a gallon of chocolate. Although the handwriting is difficult to decipher, this receipt shows highlighted in red that Betty Washington Lewis ordered a gallon of chocolate in May 1791. This love of chocolate is also evident in archaeological artifacts found through excavations at Ferry Farm. Archaeologists recovered fragments of a porcelain chocolate cup. It may seem strange to us that there were special cups just for drinking chocolate. However, since it was a luxury good enjoyed by the upper classes it had a specific set of objects associated with its preparation and consumption. A teapot or teacup could have easily functioned for drinking chocolate but the purpose of this specialized material culture was to show off wealth and sophistication. For this reason a well-to-do colonial household would have separate sets of vessels for the making and consumption of tea, coffee, and chocolate. Using the right one in the right way let your peers know you were a well-educated gentry woman or man. Chocolate cups and pots were often made of fancy material like silver or porcelain to show off the wealth of the owner and reflect the nature of the luxury ingredient. The chocolate cup recovered at Ferry Farm was painted red and blue in what is known as an ‘Imari palette’ and gilded to enhance the cup’s extravagance. Chocolate cups can be identified by their straight sides, unlike the gently sloping sides of a teacup. 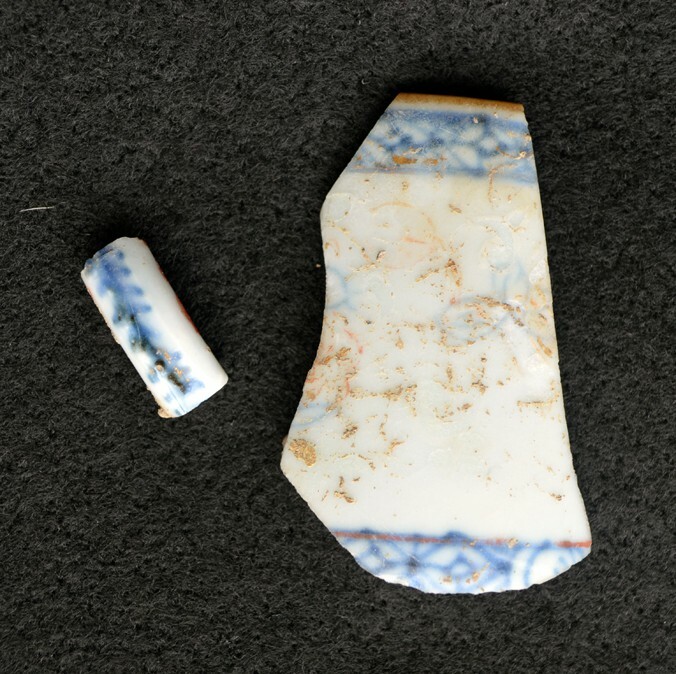 Fragments of a porcelain chocolate cup made in the mid-1700s, decorated in the Imari palette design, and recovered during an archaeological excavation at Ferry Farm. Similarly, 18th century chocolate pots generally are taller and have straighter sides compared to contemporary teapots.They also have a shorter spout with no strainer and often have a straight handle that juts out from the body. Two 18th century chocolate pots in the collection at Historic Kenmore. This cooper chocolate pot features a wooden handle, “Goose neck” spout with split tip, a hinged lid with inverted acorn-shaped knob, and a tinned interior. This cooper chocolate pot was made sometime between 1750-1770 in England or America. This ceramic chocolate pot features a porcelain pot and lid decorated with an overglaze floral design in rose, orange, yellow and green. The pot was made around 1770 at the Royal Porcelain Factory in Berlin, Germany. The lid has circular hole in center for the chocolate mill, a hinged brass cover cast in a floral design, and a brass pull-type handle on top of the lid. The maker’s mark on the ceramic pot is sword-shaped in underglaze blue on the underside of pot. The most recognizable feature of a chocolate pot however is a hole in the lid where the chocolate mill, or molinillo, would be inserted and rubbed between the hands to briskly stir the chocolate, creating a delicious froth on the top. Editor’s Note: Watch for a video exploring the topic of chocolate in colonial America coming soon! McLeod, Stephen A. Dining with the Washingtons: Historic Recipes, Entertainment, and Hospitality from Mount Vernon. 2011: 37, 51.